A candidate meet-and-greet held at Muskegon Community College Monday night saw all three mayoral candidates and 10 of 11 commission candidates share their stances and thoughts on Muskegon’s future. More than 50 people attended Monday’s forum the second held thus far, and the last featuring the full slate of candidates before the August 6 primary. At-large candidates and mayoral candidates previously squared off at Muskegon High School about two weeks ago, an event led by the Neighborhood Associations of Muskegon. Zawdie Abiade: Abiade repeated his SHAD (“Shade”) plan for action – Safety, Health, Education and Development to “help shape a more stable and effective city”. Cooperation with law enforcement, promoting behaviors that lead to good health, “functional consolidation” in the realm of education, and attracting business through rezoning were four ideas he gave during his platform comments. When discussing how to secure Muskegon’s future, Abiade said the city needed to prioritize its time and resources on developing its lakefront, increase sustainability, and work with its educational institutions. Steve Gawron: Gawron cited his successes in office thus far, including economic development around the port, downtown development, budget stability and new cities using its water system. “Positive communication with a commitment to good management, balancing the books and quality city services.” On the topic of securing Muskegon’s future, Gawron said the city must continue what it’s been working on over the past several years, including workforce training, attracting new businesses, and developing its harbor. It also needed to fight blight and crime with the help of neighborhood associations, and continue to provide essential services. Jeannette Moore: Moore’s “financial, family and futuristic” platform included addressing the loss of the B.C. Cobb plant’s tax base, keeping families intact and looking to diversify industry in the future. She stated that today’s violence is a symptom of the past failures of the city that must be cured. 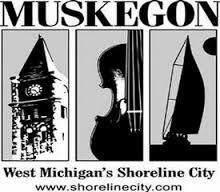 To Moore, securing Muskegon’s future requires cooperation, focusing on the positive, and getting to know one’s neighbors. Joshua EldenBrady: EldenBrady said that just as students fail tests, the City of Muskegon is failing its people. He suggested many rules and regulations were made long ago and are no longer relevant. He said that the city needs to change its policies “to help its residents shine.” EldenBrady’s list of ways to secure Muskegon’s future included recruiting local high school graduates to attend police academies right out of college. He also suggested the city doesn’t allow people to get things done unless they know the right people, and said he would change that as well to help the city thrive. Donnell Harvey: Harvey called “Muskegon is a former shell of itself” and immediately said that the city must aggressively market itself to become greater than it once was. He also said he would work hard to continue expanding the city’s role as a top port city on the west side of the state. Harvey said showing its water and land space through everything from viral videos to larger campaigns would help secure the future of Muskegon, which he described as an “unpolished gem”. Ken Johnson: Johnson said he is running because he loves Muskegon. He cited his time growing up on the east side of the city and his current residence on the west side as proof of his commitment. He also stated he would work with all of the city’s neighborhoods to bring on a “renaissance”. He said the entire city needed to play down its negatives and accentuate its positives to build a better city. Among his ways to improve the city’s future, he suggested a communication and arts center downtown, an port improvements on the east side of the city and fighting crime. Bill Larson: Larson spent a large amount of time listing his public and private experience, listing 6 years as a city commissioner and 2 years as vice mayor, subcommittee work, plus municipal and private enterprise work. He also said he did not accept any money for his campaign, so he “would not owe anyone his loyalty.” He also pointed out that most current commissioners have less than 2 years of experience on the board. Larson’s “number one” goal to secure Muskegon’s future would be to fight crime by addressing unemployment and poverty. He also listed consolidation, development of downtown as other ways to secure the city’s future. Lea Markowski: The only incumbent in the field, Markowski said she would reach “creative and collaborative solutions” through research, networking and active listening. She also said sustainable initiatives, including better land use, would be a way she would improve the city. Securing Muskegon’s future would involve a strong communication plan for residents, tourists and business, accountability of elected officials and smarter use of city funds, according to Markowski. RayCharles Roberson: Roberson said he currently works on the street level to address the city’s violence issues by talking to the city’s youth. He then said more of this needed to happen from all elected officials. If elected, he also challenged to come to him if they were too afraid to speak up to him about violence if they are too afraid to speak to police. Roberson said businesses needed to be held accountable if they are given tax breaks to come to the city, and that violence needed to be addressed if Muskegon’s future is to be secured. William Snyder: Snyder said he would be open to suggestions from all, and put financial security of the city as a top priority. He described the Edison Landing property on the city’s downtown lakefront as a ticking time bomb of debt obligations that the city will soon need to pay. Under his plan, new money for the city would not come from existing residential property taxes, but taxing new developments. Snyder said that fighting petty crime would end larger crimes, and would secure Muskegon’s future. He also said shoring up the city’s tax base would help secure the city’s future. William Springsted: Springsted cited growing up and remaining in the city’s most violent neighborhoods as part of his platform. He also appeared to challenge residents and elected officials to both step up. He spoke to residents, saying: “Everyone puts things off on the leaders… but the community isn’t coming together.” He then said “We have a bunch of leaders who vote yes on a whole lot of issues, but they don’t really care.” He challenged more people to show up to commission meetings but also for commissioners to interact with their constituents more frequently. Springsted said Muskegon needed “to stick together as a community”, across neighborhood lines, to come up with ways to secure Muskegon’s future. Dan Sybenga: Dan, who moved to Muskegon 10 years ago, played up his status as a late arrival to the region, saying it gave him more reasons to give back. He stated is top priority is the economy of Muskegon, and cited his time working as the coordinator of Downtown Muskegon Now and his current work at Muskegon Community College as proof of his commitment. He listed the many organizations he is a part of, including the United Way of the Lakeshore, the Workforce Development Board, and the Michigan Irish Festival board. Sybenga said Muskegon’s future would rely on the financial security of the city, which would come from making residents and citizens prosperous. Linda Traylor: Traylor, who runs a life skills program, cited her work with youth in the community as her top strength. “When the kids are happy, the neighbors are happy. When that’s going on, it’s better for all of us.” She stated multiple times that young people in Muskegon do not have anything to do, but did not elaborate on how she would change that. According to Traylor, studying issues, addressing concerns of citizens and communicating with other commissioners would move Muskegon forward. Mark Molitor: Did not attend Monday’s session. Learn about his stances from our coverage of the previous candidate forum. Note: Read more on these candidates in our coverage of the previous candidate forum, where mayoral candidates and most at-large commission candidates squared off two weeks ago.